Why should you spend so much money in the gym if you only need the dumbbells? Dumbbells are indeed simple, easy to use tools for basic toning and strength exercises. However, you don’t need to spend money every week if you only work with dumbbells in the gym. Instead, you should try to invest in a pair of adjustable dumbbells. What is and adjustable dumbbell? Unlike a regular dumbbell, an adjustable dumbbell has multiple weights that you can choose from. You can take it on 20 lbs as the starting point, then increase it to 50 lbs later. Having a pair of adjustable dumbbells is much more cost-efficient for the long run instead of going to the gym without using the other machines. It also ensures that you can still train from the comfort of your home if the weather is raining outside. If you need something that you can rely on for a long time, consider getting a pair of Bowflex 1090. Bowflex 1090 is very similar to its smaller sibling, Bowflex 552. The difference is that Bowflex 1090 goes to higher weights. 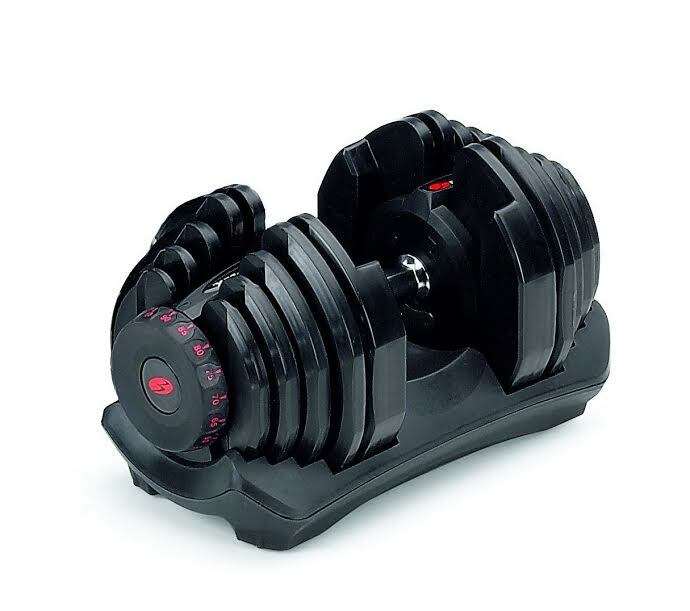 Bowflex 1090 is an adjustable dumbbell that has a weight range from 10 lbs up to 90 lbs. With such wide weight range, Bowflex 1090 is definitely suitable for beginners as well as advanced users. Beginners can start from the lower weights, gradually increasing the challenge as their muscles develop. If you have built enough muscles, you will need to increase the challenge; otherwise the muscles will not develop any further. This is where the higher weights become handy. However, unlike Bowflex 552, Bowflex 1090 only provides 5-lb increments from bottom to top, so you can’t make a subtle 2.5-lb adjustment like with the smaller model. The way to adjust the dumbbell has not been changed. First, you need to make sure that the dumbbell is put properly on the docking plate. Then, you just need to twist the weight dial to the number that you want. The dumbbell itself will do the rest; it will release and take the discs as needed to provide the selected weight. We are really glad to see that the dumbbell works very smoothly and quietly. Included with the dumbbell is a workout DVD titled “Secrets of the 4-Step Rep”, which contains more than 30 exercises. This DVD can be very handy if you are looking for new, creative ways to train your muscles and not to get bored with your workout routines. Check the best price of Bowflex 1090 here!